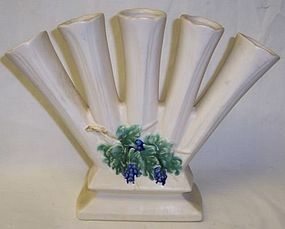 This is a really great Antique Curio Five Finger Vase made by McCoy in 1962. This Vase has a white matte finish with grapes and leaves on the front side. It measures 8 1/4 inches high X 10 1/4 inches wide at the widest part. It is in very good condition with no cracks, but does have a 1/4 inch chip on the bottom back corner. The Vase has some natural crazing from age, but does not take away from this wonderful piece. It is signed McCOY USA. We guarantee all items to be as described. Feel free to email any questions. THANK YOU.